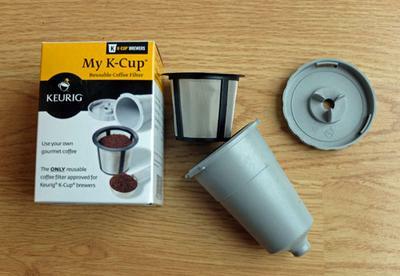 The My K-Cup reusable filter for Keurig brewers. The Melitta JavaJig reusable filter system for Keurig. What exactly is the K-cup made of? What grade plastic is it? Good question. I have a Keurig brewer myself and have opened up a K-Cup in the hope of being able to find some clue at to whether the plastic is recyclable. But I haven’t found anything – not the recyclable logo, nor a number. In addition, it's tough separating the plastic cup from the foil lid and the filter material that is attached inside. I have pretty much given up on being able to recycle the used K-Cups. It's frustrating, particularly when you see quite a pile of them building up in the garbage. More and more now I use a re-usable filter basket. After each use I simply pour out the used coffee grinds, (for my compost), wash the filter and use it again next time. The filter I use is the Keurig My K-Cup Reusable Coffee Filter . 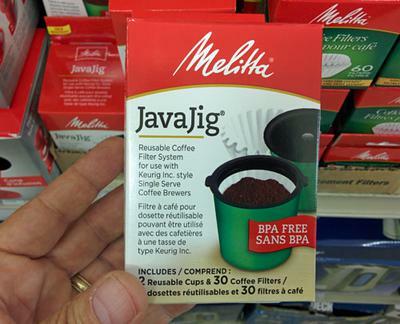 An alternative that has come out recently is the Melitta JavaJig. (Click on the small photo above to see it in full size.) As you might expect from Melitta, it’s a small plastic cup into which you place a very small filter paper. After each use you can simply toss the paper and wet coffee grinds into your compost bin. You can get the Melitta Java Jig at Amazon.com . Comments for Can I recycle my Keurig K-Cups? I remove the foil lid, empty the coffee grinds into my compost bin and rinse throughly. I stack the pods together, push the foil into the top pod and put in my recycle bag (the one that takes non-pliable plastic, glass and foil). I also use the pods to start my vegetable seeds in the early spring. If you do an Internet search of where you live you may find several places that recycle k- cups. In both Alberta and b.c. There are a number of coffee companies that take them. They are recycled into cement mix. http://www.recycleacup.com has a nifty tool for separating and recycling the plastic and foil while you put the grounds in the trash or compost. I feel better about K-Cups and the tool works well for me! I have been cleaning them out and putting out in recycling. No repurcussions yet. I used to have a K-cup machine. Now I have a Vue-cup machine. The Vue-cups are recyclable, because they have a disposable filter underneath the aluminum foil, that you peel off and throw away, leaving just the plastic. I mention this, because the K-cups seem to use the exact same type of plastic. The problem is, I don't believe that you can easily peel off the foil and just toss it. If you want to take the time to rip away the foil on top and either toss the grounds into a garbage disposal or toss the loose grounds into your garbage can, then you should be able to recycle them. I use the empty K-cups to line the bottom of large flower pots. It keeps the pot lighter and easier to move, and give space for drainage. They work better than rocks in the bottom of a pot. I first peel the foil top and put the grounds into my garden soil. The foils can be rolled together and put in your weekly recycle container. The empty used k-cup most recyclers will pay $20.00 per ton for. You can absolutely recycle your used K-cups. Keurig offers a program called Grounds To Grow On. How it works is contact Keurig and tell them you would like to participate in the program. They will then mail you a G2G recycling boxes as well as the returned postage to send back the full recycling boxes. I like the idea of growing seedlings in old K cups. I will have to think of other possibilities. I switched to the Keurig after owning a Tassimo for 4 years as Keurig allows for use of your own coffee in the my K-Cup. I also peel off the foil and compost the grinds, never thought to recycle the foil though. The heated water is in the plastic container such a short time, and mainly flowing through the grinds, can't see it having an impact. Sorry. We recycle EVERYTHING here, and have composted for YEARS (9). I hate throwing away the plastic k-cups, but every business creates it's own waste products, coffee makers included. If you are living somewhere that uses electricity, chances are you are involved in non recyclable waste, and ingesting other carcinogens. If you don't approve of the Keurig, don't use it. I only see a couple of people here composting the insides of the cup. It is so easy to do. I take a paring knife and cut around the rim of foil, remove it and pull out the grounds and filter. I can do 10 cups in less than a minute and the filters and coffee go into the compose while some of the cups are used for seed starters. We also use our My K Cup most of the time. I just started gardening... as others stated, I used the grounds for compost and the K-cups as little planters to grow herb seedlings which can be reused several times. They already have the hole for water drainage. Once the seedlings start growing leaves, you can transfer them to a larger planter for your kitchen or give as gifts. This is a great project for kids. I'm thinking of setting up an educational partnership program between secondary schools and local businesses that produce waste grounds and K-cups to start summer programs. Kids get to learn how to recycle their parents' K-cups and get to watch their little plants grow. I truly hope the commenter above who predicts Keurig is a fad that will die out is correct. I was stunned when the regular coffee maker was removed from my office and replaced with a Keurig. Even more stunned when my coworkers didn't revolt. And revolted when my coworker actually drank the stuff. Yes, the waste is ridiculous. But isn't heating up low quality "coffee" grounds that has been sitting in flexible plastic and then ingesting that contaminated water more than ridiculous? I think it's moronic. Reuse K Cups even after the inner filter is gone! If there aren't any currently in stock, just convo me through Etsy and I can make up a batch just for you! It seems to me the cup could be made of aluminum, like a soft drink can. Then the entire cup could be recyclable. It may be recyclable even without emptying the coffee grounds and paper filter, as I'm sure the recycling method would separate those from the cup. The Keurigs should be able to punch a hole in the bottom of the can without any problem. I cannot comment on how the shipping and manufacture of aluminum cups would affect the overall green footprint, but it would reduce the amount of plastic reaching the landfill. by: Julie was good reuse of k-cups. Also they sell lids that you can now reuse them up to ten times. Just search on "my k-cup leaks" many options. Yes, the k-cup is an environmental issue. It's convenient, but very wasteful. Here's an article from a website that doesn't have ads selling k-cups - no greenwashing here! Starbucks produces much more landfill than Keurig and can't believe they don't offer recycling in their stores. And their cups are completely recyclable. Actually, it is relatively easy to remove the foil from the top of the cups. Just use a butter knife to cut a slit in the top and then use your fingers to remove the foil. I collect the used K-cups in a container during the week. Once the container is full, I remove the foil pieces from them and put them into a small cup (aluminum can be recycled!) and I then remove the coffee grinds and the inside paper filter and put them into my compost green bin. The only tools I use are my fingers and a butter knife. It really only takes a few minutes to do and the only thing left over is the actual plastic cup which I do not believe is recyclable. I have been reusing the small cups for growing seedling plants in the spring. after thinking about all this and the negatives associated with plastics, i feel we need a stainless steel My K-Cup. It would be a bit pricey but last forever, no off taste, and no plastics concerns. Can Keurig please do this? does anyone know if k cups contain phthaltes? they are chemicals used to make platics among other things. not good stuff. Thanks for the elastic band trick! It worked. I simply placed one around the top of the bottom piece that the filter goes into and put the cover on. I actually had a relaxing morning with a great cup of coffee. THANK YOU! LOL. Okay, I have a Keurig and LOVE IT! I have been using it almost a year now and have no aches, no pains, and enjoy a fresh cup of coffee every time! It never ceases to amaze me thought how so many people become doctors, scientists and environmentalists when they want to trash something or someone and find an easy avenue to do so. Remember, everyone has an opinion. Mine is that it is a great way to enjoy a fresh cup every time and if that is what you would like, then for goodness sake go ahead! After struggling with the single cup Keurig for 6 months (yes, it was a Christmas present) I finally took advantage of a great deal from Community Coffee and got a Bunn coffee maker that uses high temperature water and makes 8 cups at once. Since I make up my own blend and pulverize it before brewing, it only takes 3 level tablespoons full and I first brew with a quart of filtered water. When that is finished, I put in another quart of filtered water and brew that while I am enjoying my first couple of cups from the first brew. Bottom line, the coffee is perfect, the price is about 1/5th what the Keurig cups give you and it is so, so much more convenient. I just keep the extra in carafes - lasts all day and into the next! Just as tasty on day 2 as brewed fresh. This is a follow-up to a prior posting where I shared how I refilled my Keurig K-cups. I also bought a Keurig coffee maker over a year ago because my niece loved hers. I know about the health risks until I suffered from them myself. Last summer my elbows and knee joint started hurting to the point I went to the dr. and then I stumbled upon this website and realized that it was from the k-cups. I quit using them and all of my pain went away. I was even tested for lymes disease thinking that was causing my pain. Everyone that suffers from joint pain that uses a Keurig should stop using the machine for 3 months and see if their pain goes away and if it does report it to your doctor so they record the findings before it causes permanment damage. I havent had any joint pain since I quit using my Keurip. Its up for sale if anyone wants to buy it. For "green" use of the Keurig machine, use the reusable MyKcup and use ground coffee - period. If it's too weak for your taste, add more grounds or get a stronger roast. Mine works fine for my taste. If it leaks, seal the connection with an appropriately-sized rubber band or "o" ring. If you don't want the hassle of dealing with grounds, use coffee Pods in the MyKcup. I'm not wasting too much time worrying about the Kcups in the trash when I'm recycling 85% of my other household and work refuse. The Kurig folks are working on a solution. Until then, I will enjoy my Kcups without too much guilt. It's the epitome of convenience and variety, pure and simple. If I didn't want convenience and variety, I would still be using my Black & Decker carafe brewer. I am concerned about the warnings of the use of aluminum in cooking in relationship to Alzheimers. Also the possibility of carcinogens and heated plastic, which has already been addressed here. I just got the Keurig last night and I am going to return it. The health concerns including the muscle aches are considerations that I cannot ignore as well. I think the machine is appealing to people that love variety in coffees for the most part and for others, having the newest and latest of whatever it is they are seeking to purchase. Of course I am sure there are other reasons but I think those 2 reasons for purchasing this machine, are among the top of the list. It doesn't cook any faster than my previous coffee machine that has a regular filter. I preferred that as I just had to walk over and pour my coffee anytime of day that I wished to have it until I found very small pieces of plastic leeching into the coffee. I would have mistaken them for loose coffee grounds had I not been the careful type and checked. I got rid of the machine immediately. I am pretty sure that the Keurig is a fad that will die out. But that is not a problem in itself. Health risks are. I am thinking that heating a pot of hot water in a non aluminum coffee pot on the stove with instant hot coffee and no plastics involved is a better alternative. I have a coffee grinder. Does anyone know if I can use it to grind coffee into instant coffee so that it is fresh and not stored in plastic jars? Keuring should be ashamed of themselves. When they first started showing up in businesses, I could not believe,that in this day, someone would create yet more waste...and people bought them!!!! If you are going to all the bother of removing the lid on a k cup, emptying out the used grounds and refilling the cup and cutting out foil to replace the original, what is the advantage over using a regular coffee maker? It tastes better? Maybe you are ignoring the fact that heat leaches carcinogens out of plastic. ( Ths can happen even without heat). I have the screened cups which I use to get enough coffee for 2 cups - I use a tamper from my expresso machine to loosely tamp the coffee and I have the plastic disks with the hole in them to use with refilled K-Cups. I put the coffee in loosely and do not tamp... sometimes I need to put porous paper - a small piece of paper towel to cover holes. I only get one cup of coffee from those. After saving the used grounds and accumulating them, I run a regular coffee maker with them to make a pot or two of coffee - save it in carafes to mix in with K coffee. This approach is not as hard or labor intensive as it may seem - cuts the cost considerably and we still get a great cup of coffee every time. If the plastic cups are such a big problem why not get the My K Cup. It is re-useable and heat safe and you can control how strong or weak you want your coffee with every cup. No more dangerous plastic, no more recycling problems and perfect coffee all at once. As they used to say "DUH!" From inspecting everything that comes in and out of my home, the K-cups seem to be a number 6 plastic, which is polystyrene and not safe when heated. This is an educated guess. I actually came up with a method of removing part of the plastic. You have to leave a portion on the bottom for the trigger to work the K-cup machine, but you can cut the rest of the bottom out and part of the side. If only I can figure out how to recycle them. I won't reuse the plastic as a filter, because I believe it to be toxic. 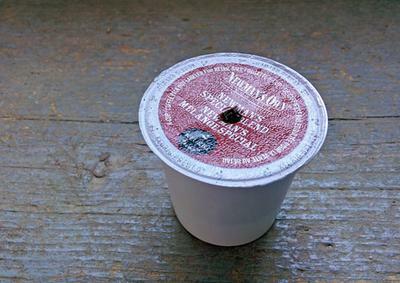 The cheapest way to recycle k cups is to take the foil from the k cup , rinse the cup and let it dry. While drying get a same amount of aluminum and lay the top of the k cup on the foil and draw a circle around the k cup with a sharpie. Cut the circle about a quarter of an inch bigger, after the cup is dry fill with any flavored coffee , center the foil on the cup and press the foil as tight you cam get it under the lip of the k cup. Mark the foil with the coffe type. You can also use a hair dryer to try the k cup. ENJOY. is the plastic safe to be heated? I called Keurig and asked them if the plastic cups leached out hazardous chemicals... they insisted the cups were safe. I asked if they tested them, they said yes. I am expecting a call from a tech person. I actually love my coffe maker, but wonder about the heated plastic... anyone else have an opinion on the chemical side of this? It's easy to pull off the foil and put the liner and coffee grounds into the compost or throw it in the garden (great for soil). I just keep a can under the sink to collect them, and I know someone who has their kids clean them for a nickel. I'm so glad there are people who make the effort and realize that we are responsible for our own garbage. Let's hope that the "let "them" worry about it" mentality is outgrown. Thank you rimrock, I also recycle as much as I feel I need to. Those little cups are not one of the things I worry about in a landfill. It's nice to see a reasonable opinion once in a while. - empty the used coffee grounds and save them. Once I have a measuring cup or so full, I make at least 2 pots (12 cups each) of coffee from it. This I put in vacuum carafes to hold for use. - I reuse the k-cups by spraying them off and putting them through the dishwasher with a normal load of dishes. Then I air dry them and put 2 heaping teaspoons of coffee in them and tamp them down gently with an expresso machine tamper. I use my own mix of coffees which includes whole beans, expresso, cinnamon, cocoa, cumin and chicory... it is really good coffee. - I also use the regular reusable k-cups and tamp them even harder than the regular k-cups - get 2 strong cups of coffee that way. It's more work than I did before just brewing coffee in a regular coffee maker. But I gotta say it tastes a whole lot better because, on average, it is fresher than what I made before. And yes, I use a bit of the vacuum carafe coffee to top off the cup from the Keurig since I was given the mini maker for a Christmas present. First, how many plastic containers do you drink/eat/take food from that have plastic liners? Like many issues I think the concern over negative results to our bodies by a K-cup is out of proportion. To recycle? I do a lot of recycle BUT I am not going to take a small container apart piece by piece to get to the part that is recyclable. There are more containers being thrown into our local waste dumps that could be recyclable than we know about. I won't get into the debate about plastic/health concerns. My comment is about pulling the K-Cup apart so it can be recycled. When the cup is still hot, I pull off the foil top, pull off the filter and the thin plastic lining that covers the hard plastic. I find if I start it right the thin plastic comes out pretty much in one piece, except it sticks on the bottom. A little pull is necessary. Once the cup is cool, I can't pull the thin plastic liner out. This sounds complicated and time consuming, it's not. As soon as the coffee is brewed, I lift the handle and remove the K-cup. Once you get used to the peeling process, it possible to completely remove the foil lid, nothing left around the edge, completely remove the filter, but you must grab the thin plastic that is behind the filter. My town accepts #2 thru 9, I am assuming that w/o the thin plastic liner, the cup qualifies. Anonymous very much and I suggested to Keurig that they check into the problem and include a rubber band in the My K Cup boxes. How much water R U wasting washing out the K-Cups?? I put mine aside after use..let them dry..use a small sharp paring knife to cut off the foil..I dump the used grounds into my regular brewer filter along with my regular ground coffee..it gives the coffee extra flavor and reuses the K-Cup grounds 1 time!! I only use 1 K-Cup in the AM and then brew a pot using the method described above.. BUT!!! the K-Cup still goes in the re-cycle bin!! hopefully after that it gets re-cycled??? Try the refillable "Solofill". No need to remove basket because it's the size of a K-Cup. If your gray refillable K-cup leaks, you can put a rubber band around the top of the bottom section to give a tight seal. We also, put a #6 O ring around the rubber gasket that surrounds the piercing needle. The rubber gasket slips off quite easily and then the O ring can be added. Editor's Note: Great point about the thick rubber gasket on the piercing needle. Ours comes off from time to time. I'll try your idea! Ask your local Boy Scouts if they can do anything with them. They are resourceful and can make projects from them. Give them the challenge to find out if they are recyclable and I'm sure they'll take it on. I have discovered a way to just make your own lids. After your tear off the old top, tear off a strip of aluminum foil about 3 inches wide. Then cut a circle about 2 5/8 in. in diameter (I used a 1/4 cup measuring cup), and fit it tightly over the top. You will need to crease it under the top lid. Cheap refils, and you don't need the plastic lids. Also, I like to thank the people that wrote about the plastic cups, I hadn't even thought about that. The Problem Starts At The Beginning. K-Cups end up in the trash eventually. They cannot be recycled indefinitely. Sure, you can reuse them to some degree. Of course, the manufacturing process and packaging for K-Cups (and any plastic) is harmful to the environment, and uses petroleum. On top of that, you cannot entirely recycle the plastic, and if you can, there's more petroleum being used. A better solution? Keep your old coffee maker. Let's be honest here: the main selling point of the Keurig is "fresher" coffee. If you want fresh, grind your own beans. Keep your beans or ground coffee stored properly. Brew what you need. Employ a reusable filter basket. Use your grounds for compost. What have you wasted now? Nothing. Well, except for the fossil fuels used to get your coffee to you, and you to the store to get your coffee (unless you rode a bike). oh my gosh! On a wild hunch, I decided to see if there was anything online about muscle pain and a risk from the K cups. One day out of the blue, my knees swelled up like crazy. After a few weeks of up and down symptoms, I saw my doctor. I ended up on high doses of ibuprofen and wearing knee supports for a week. I had a slight positive reading for rheumatoid arthritis, and now I have to go for a nother more sensitive blood test. I ALSO noticed the days I use the cups, I get the aches. When I use my regular perc maker, I don't. I too thought I "was crazy!". My teens also drink the K cup coffee, starting today, not anymore! Yes! I had the same symptoms. I am 24 and my legs (from about my knees down) started aching terribly when I was drinking a lot of Keurig coffee. It got so bad that I would lay on the couch for hours with a heating pad on each leg and still couldn't find relief. I ended up going to several doctors (including a rheumotologist), as the pain would not cease. I was unaware of what was causing such symptoms. I ran out of k-cups for a while, and noticed that my legs started to feel better. I tried drinking it again and the pain started up again. My friends and family think I am crazy, but I swear it only flares up when I drink those k-cups! I am glad to hear someone has the same issue! now how much $ must I pay you, atop shipping charges so that you will recycle my cups? Editor's Note: Good for you! Do you have any information you can share? A website? I have had my Keurig coffee maker for a little over a year now. I told a friend of mine about it and she notice shortly after buying hers that both her and her husband started to get muscles aches. They stopped using their machine and all soreness went away. My husband and I suffer from muscle aches but thought we were just getting old. Re-use K-Cups? Then what's the point? There seem to be a lot of people here who are re-using K-cups out of concern for the environment. While I applaud and share their concern for the planet, I really have to ask why you would bother to do that, and not simply go back to an "old-fashioned" drip coffee maker with bio-degradeable paper filters? As I see it, the whole advantage of a single cup coffee maker is NOT having to buy/grind/scoop coffee or clean it off the kitchen counter. By re-using the cups with your own coffee, you're reintroducing all those things, so the convenience factor of a Keurig goes right out the window. You now own a coffee maker with all the drawbacks of a drip, AND it can only make one cup at a time. Plus, if you're re-using K-cups it's highly likely the plastic breaks down even more the second or third time you use them, so you're sipping plastic with every cup. Yum! And, you ultimately still have to throw them in a landfill. So, basically you've now got a coffee maker that is LESS convenient than a drip, more expensive than a drip, and worse for the environment than a drip. I don't get it. Solution? Live with the guilt of increasing what goes into our landfills, OR stick with a drip and keep on grinding beans. It's not THAT difficult, and certainly easier than emptying a tiny little plastic cup, filling it again and covering it with tinfoil. Truly a viable option for less waste and cheaper k-cup coffee!! My Kap - reuse your k cups! I have bought the My Kap online at both Ebay and Amazon. It allows you to reuse your k-cups as many as 15 times. You simply remove the foil and rinse out the coffee. You can add whatever coffee you are feeling like and the 'my kap' acts as the foil previously on it. It works great! I have saved a lot of money and it feels better when I consider the environment. Just remember to remove it before throwing out your k cup! I accidentally threw my first one in the garbage - thus having to buy more! ooops! K-Cups? What to do? Are They Safe? PODS! PODS! PODS! That is the answer people. 12 oz+ single cup regular, medium and bold cups of coffee for the entire household for over two years, and yes...pods are recycleable and no need to worry about carcinogens leaking or leeching out. Black and Decker is another brewer with a basket you might want to consider if you can not find the SB BS. You have to wonder with k cup. Very thin walled plastic, anybody know what type of plastic? Anyway thin walled and has anywhere from 168 to 198 degree water pulverizing through it mixing with the obliterated grounds that must be finer than Turkish Grind to allow the 6 oz cup below recieve the watery drink in less than 50 seconds. "Well the safe plastic #'s are 1, 2, 4,& 5." If by "safe" you mean they are certified for direct food contact, that is incorrect. There are many different grades to each plastic resin. Most are available in "FDA Direct Food Contact" grades, but that does not mean that any product formed in these resins are safe for food consumption. If by "safe" you are referring to being able to recycle them, again, it is not as easy as that. Both #3 Polyvinyl chloride, and #6 Polystyrene, can both be recycled very easily. PVC (#3) piping is many times extruded from post-consumer content material and Polystyrene (#6)is recycled in packaging films among other things. Well the safe plastic #'s are 1, 2, 4,& 5. WHAT are The KCUPs???? I see the waste, and HATE it. Ive been cleaning out my cups (about 6 a day) and putting them in the recycle bin, But now i KNOW its a waste of my time. My husband And I drink WAY different strengths of coffee, His STRONG, mine regular. So this has been great, we each get what we want. How do you brew a reg. pot like that?? I recycle them. I save them up all week and then on the weekend I pull them all apart, add the liner and coffee grinds to my compost and throw the washed cups in the recycle bin. Until there's a solution to recycling K Cups, how about finding alternative uses for them instead? I've been using mine to start seeds for my garden. I hate waste. I do, but I love my Keurig, and so do my roomies. We all have different favorite flavors and drink coffee at all different times of the day, so the Keurig is perfect for us. We put the cups into a basket after we use them to dry a bit, and every couple of days I'll take the cups we used (the caffinated ones) and peel off the tops, knock the grounds into a bowl (for compost or herb planters) and wash out the cups and leave them to dry. Then I use those as needed for decaf coffee at night. I hope they come up with a solution to the environmental impact. I hate feeling guilty drinking coffee, especially when this system meets the needs of our household so perfectly. According to a representative of Green Mountain Coffee Roasters, Inc., K-Cups are not recycleable. "The current structure of the K-Cup includes Oxygen and moisture barrier materials in order to maintain coffee freshness. As a result, the K-Cup is not recyclable." Simply use the EZ Cup system. You purchase an EZ refillable cup, as well as filters. You simply insert the filter, add your coffee, slip the top back on, and you're done. I use it all the time and love it! Along with the benefits of not polluting the earth, you can use your favorite coffee or tea anytime. Are they able to be recycled? I am reading and reading. There are a lot of neg. things about this machine I love. I want to recycle. I have recycle pickup. I don't have to seperate. Are they recyclable? Are these harmful to me? Are they harmful to the enviorment? Thank you. DO I get an email with the replies? actually, they did think of it, are are currently working to make it biodegradable. the reason it is not biodegradable is because cancer seems to be a bigger issue at the moment than a k-cup in the trash. GMCR, the parent company of Keurig, has been working to find a plastic that will not melt/deform due to the intense heat and pressure from the machine. if you want your k-cup to melt into your hot cup of coffee then you're in luck they already have the technology for that. to sum up, GMCR is a very green company and does a lot of great things for the environment so try looking them up and read a little. they are in business to make money. saving the environment one k-cup at a time must come after. NOT think this through when inventing this machine, or they just did not care about the invironment. My mother got a Keurig at work, and when she did they were told that they would also get a recycling bin for them from the company.... so there must be something out there. I have one at home. LOVE IT. Don't love the waste tho. I used to use up to 6 k-cups a day. Now I just use 1. After I brew the fist cup I remove the foil top, empty the grounds, refill with fresh cofee, put a little aluminum foil over the top, and brew as usual. I line up the hole in the bottom and use the same aluminum top several times. I throw the k cup out when I've had my fill of coffee for the day. I do have the reusable my-cup, but coffee doesn't taste nearly as good as when I use this method. I haven't used it, but it seems kinda brilliant, assuming you want to take the time to re-load, rather than just buy & throw away every time. Inspired, in part, by this thread and others like it on this site, I have started work on a whole new site devoted to the dangers we face from many of the plastics in our homes. Thanks everyone for the inspiration! I have a ton of pages to write, but have just uploaded one on the topic of BPA-free coffee makers. All plastic is bad for you, because nothing that goes in to making plastic should ever go into your body. it's all toxic, in small amounts yes, but small amounts consistently over time adds up to a lot. Hot water and plastic going into you every day is going to cause high levels of xenoestrogens being stored in your fat, so you will get fat easier, more likely to get cancer etc. BPA is just one of the many bad things in plastic. We know BPA is bad because some people bothered to study it, but don't think just because we haven't studdied all the otehr junk in plastic that all the other parts aren't bad for you too. What would be a great idea is a reusable K-kup that is glass (pyrex?) or maybe stainless steel. That wouldn't be too difficult to produce would it? Although it does kind of defeat the whole point of the K-cup - ie. laziness. I just reused my K cup after rinsing it out and adding my own coffee. I filled the cup about 2/3 full and cut a small of aluminum foil and fit it firmly around the top of the cup. I've only done this one time, but it worked perfectly. who cares about bpa just drive your fossil fuel burning subaru to a tree saving convention while enjoying your burning carsonogenic green herb.... oh yeah and vote for "change" yeah thats the ticket :} seriously ther are way bigger issues to worry about.. like global warming oh nevermind!! Happy New Year to all..
For Sale: One Brand New Keurig Office Pro Never Used. Since It causes Cancer I will not be using it. Thanks to all the posters for the heads up. Purity is a way of life. Smoke Pot and live well. It looks like the good old "brewing a pot of coffee" is one of those "green" alternatives for the time being even though K-cups appear to offer good batch-to-batch consistency. I realize in our lazy society (or "I am always so busy" excuse for not being cleaner on the land we live on) may not want to brew pots of coffee though in the name of cleaner environment. Instead of using and throwing away K-Cups every day, another alternative is to buy the Pod Holster. It's plastic, but you use it over and over again. With the Perfect Pod Holster you use coffee pods, the same ones you would use in a pod brewer. You stuff the coffee pod into the Pod Holster and then put the holster into your Keurig Brewer. It's the same size as a K-Cup. The advantage is that instead of throwing away unrecyclable K-Cups by the dozen, you can add the used coffee pods to your compost. Even if you don't do any composting, the used pod is recyclable, unlike the K-Cup. We compost the coffee grounds (and some times the paper filter). Works wonders. Unfortunately, the plastic cup is not recyclable. What an excellent idea for the seeds! I'm going to try it myself for a mini herb garden! BTW to all those complaining about the cancer causing material from plastic, how many containers of liquids have been bought over the years and still now that get hot in trucks and then cool down that we drink? How many old plastic pipes are there in places that may contain funky chemicals that we don't know about? How many plastic items get heated in microwaves, dried, and then we put water or food on them? How good besides wonderfully tasting is coffee for you anyway? How many people live to be over 80 over the past number of years and have used plastic forever?? There are bigger things to worry about! How many smokers are worried about plastic and not cigarettes or how many people are eating junk food while typing about health issues?! Is reuse of k-cups possible? different grinds and they all come out tasting like water.Any suggestions? Yes! There is a great coffee named Baronet who makes biodegradable pod that serve this purpose. Check them out online. "The idea that hot water going through plastic causes cancer is a wife's tale. Check Snopes and you will find that it is false." And Trans-Fats are actually "cool" fats that don't do any harm right? You really should do your research before you post a misinformed comment that can hurt other people. I like how that one user actually posted a research article. The K-brewer was probably patented and produced before the issue of BPA emerged and I doubt that the sections touching the water are really BPA free. The Coffee portion is BPA free, but what about the water that's used to make the coffee? I was going to buy a K-brewer, but will look elsewhere. And you're still filtering your coffee through the original paper filter. What I am looking for is a paper filter that fits into the re-usable K-cup device. The device comes with a mesh filter but that let thru the oils and fine sediment. I form a filter over a medicine bottle and put it in the wire baket and cut off the part that extends over. It works well but there's got to be an easier way. Does anybody know of a filter company that makes one? I contacted Green Mountain also and got this response. The K-Cups are BPA Free. There is some BPA in the brewer itself, but it does not come into contact with the coffee. I sent them a follow up question, "Does the water that gets super heated come into contact with BPA material?" I am awaiting an answer. My wife will not open the brewer box until this question is answered. >>The K-cups are a multi-layer composition. PE/EVOH/PS. The cups are not recyclable...although we always strive for new and better materials. ...[A] new study, published in the Sept. 17, 2008 issue of the Journal of the American Medical Association, was based on analysis conducted at the universities of Essex and Plymouth in the U.K. and at the University of Iowa. Scientists analyzed U.S. government data (collected from 2002-2004) on urine samples of 1,455 Americans 18 to 74. They found that higher urinary concentrations of BPA were associated with increased prevalence of not only diabetes and heart disease, but of related liver enzyme abnormalities as well. The JAMA researchers note that their results do not prove causation, and independent follow-up studies are needed, but they come in the wake of evidence from animal studies suggesting adverse health effects from even low-dose exposures. Since Consumer Reports first warned about BPA in baby bottles in 1999, evidence of BPA’s toxic potential has continued to build. In Consumers Union’s statement for the FDA meeting, Urvashi Rangan, Ph.D., Senior Scientist and Policy Analyst, repeated calls for a more scientifically sound assessment and urged the FDA to eliminate BPA in food and beverage containers. “A margin of safety exists that is adequate to protect consumers, including infants and children, at the current levels of exposure,” Laura Tarantino, a senior Food and Drug Administration scientist, told the expert panel on Tuesday, in remarks reported by the Associated Press. But in tests conducted for Consumer Reports magazine, BPA has been found leaching from baby bottles and certain types of large containers of bottled water. Studies by other groups have reported elevated levels in canned foods and infant formula. And the authors of the just-released JAMA study point out that exposure to BPA among the general U.S. population is likely to exceed limits set by the Environmental Protection Agency for the "reference dose," or the daily exposure that is not likely to cause harmful effects. I therefore think it is best to be cautious until we have more info from actual researchers - and not just anonymous tipsters on the Internet, who may be plastics workers or investors for all we know, or government officials who might be motivated to protect the industries that lobby them. I wish Keurigs had paper filters and a non-leaded metal (such as stainless steel) filter holder, so we could enjoy coffee from it. I'm not planning to make any coffee with it for now, because of the plastics / bisphenol A concern. The idea that hot water going through plastic causes cancer is a wife's tale. Check Snopes and you will find that it is false. This is all very intersting. I have been drinking Keurig-made coffee for about five years, and never gave this issue any thought until a few days ago. My brother posed the question to me: "Don't you think pouring piping hot water through cheap plastic can cause cancer?" Certainly, you wouldn't put food on a plastic dish and heat it up in the microwave. My internet search has revealed very little on this, and nothing that I would consider to be academic much less empirical in nature. It does cause me concern, though, especially in that I drink 5 to 10 cups of coffee and tea (the Celestial and Bigelow teas are fantastic!) made from these K-cups each day, every work day, and have done so for many years. Is anyone out there aware of any scientific studies or lawsuits respecting the foregoing? I'll check back, please let me know, because it stands to reason that maybe I should change my choice of beverage. Bisphenol A in Keurig K-Cups? This echos the previous person's concern but I would like to know if there is any Bisphenol A in the plastic used in making the K-Cups? How can one find out? Lastly, is there any obligation on the part of manufacturers to report the kind of plastic that is being used? It'd be horrible if I was drinking BPA that leeched from the cups! Does anyone know anything about possible health risks associated with using a Keurig? The water is afterall stored in a hard plastic container...and then you pipe that water through a plastic filter cup at extremely hot temperature...and I think heating plastic is what brings out the carcinogens...right? I mean I hope it's not true(!) But does anyone know anything about the plastics they use? I plan to reuse at least a few of my K-Cups. I cut the foil top off but left the paper filter in. I will start garden seeds in them for next year. The hole already punched in the bottom will allow for water to drain. We'll see how it goes. If it works out, I will give them out to all my gradening friends.